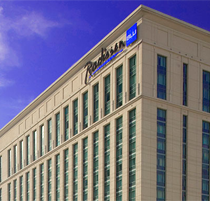 The Radisson Blu, Cebu is the official conference venue for the World Ecotourism Conference 2013. The Radisson Blu Hotel Cebu provides deluxe accommodation with incredible city and Mactan Canal views. Enjoy plush, comfortable rooms with thoughtful amenities including Free Wireless High-speed Internet access. Dine at the hotel's delicious Feria restaurant. For fun and relaxation, take a dip in the 800-square-metre, free-form pool. The 301 Superior Rooms at this accommodation in Cebu welcome guests to relax on a memory foam bed with goose feather pillows and a down-filled duvet. Feria, the hotel's premier, all-day dining restaurant serves fresh, local cuisine as well as a variety of international dishes, providing variety and convenience for guests. On-site services include the Business Class Lounge, the Fitness Centre and spa, 24-hour room service, and free high-speed, wireless Internet access. Facilities include the Santa Maria Grand Ballroom, the Nina Ballroom, 10 function rooms, and the Event and Meeting Plazas . Each of the hotel's 400 rooms includes thoughtful amenities such as an iPod docking entertainment system with alarm clock, an LCD television with cable channels, a safe and free Internet. Feria, the hotel's premier, all-day dining restaurant serves fresh, local cuisine as well as a variety of international dishes, providing variety and convenience for guests. Feria's culinary team boasts of chefs from Italy, China, Korea and the Philippines, who all carefully prepare authentic dishes from their respective countries. Other on-site service features include the Business Centre, the Business Class Lounge, the Fitness Centre & Health Club, the Blue Spa, Swimming Pool with The Pool Bar as well as the The Lobby Bar. The hotel is located right next to the SM Mall - a massive shopping complex. This hotel is a bit expensive to stay. but you will be able to find value there. It's perfect facilities ,fantastic breakfast and modern interior. also you can go to SM mall by walk. it's very near..